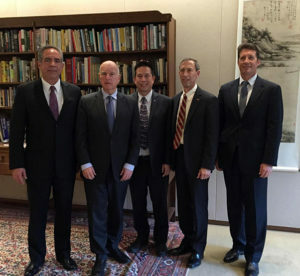 From left: Armstrong center director David McBride, Governor Jerry Brown, Ames center director Eugene Tu, JPL deputy center director Larry James and Ames deputy center director Tom Edwards. 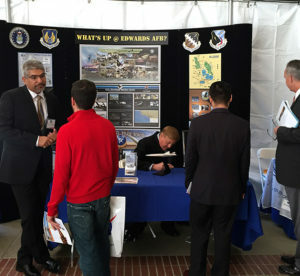 A three-man team from Edwards Air Force Base, Calif., took a trip to the state capitol Feb. 29-March 1 to tell the story of Edwards at the fourth annual 2016 California Aerospace Days. That team was Dr. David Smith, 412th Test Wing Installation Support director, Humberto Blanco, 412th Plans and Programs deputy director, and Ken Neitzle, U.S. Air Force Plant 42 airfield manager. The two-day conference for legislators at the California State Capitol brought together state lawmakers and their staff to learn more about the importance of aerospace to California. Panelists discussed the many great things being done in the aerospace sector throughout the state and also addressed any concerns or challenges in the current economic and political climate. The purpose of the trip for Edwards AFB was two-fold, to emphasize the huge impact of the aerospace industry in California to state political leadership, and to share the Edwards mission with the general public. According to Blanco, the first day was spent in briefings. They heard presentations from women in Science, Technology, Engineering and Mathematics (STEM) along with astronauts and engineers. While Edwards did not present, Blanco found it educational to listen to the other participants. “We also went to the senate floor and we experienced how some of the decisions are made,” he recalled. 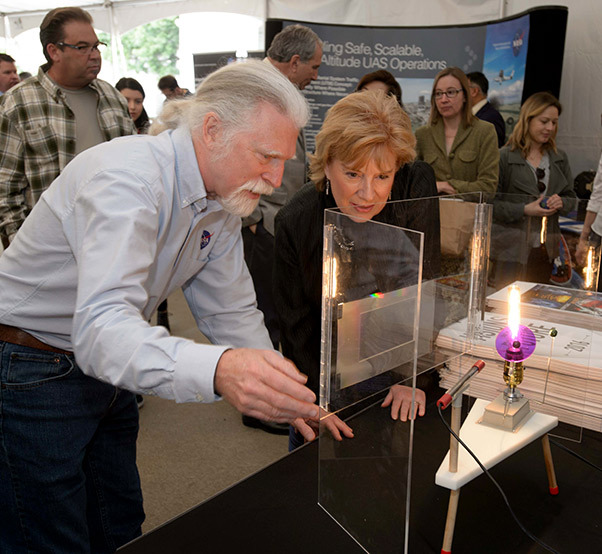 Steve Howell, Kepler and K2 mission project scientist shows a Kepler display to California State Senator Fuller. The first morning was dedicated solely to local politicians, but in the afternoon the general public was invited to come in and talk to the aerospace companies represented. Among them were NASA, the Air Force Research Laboratory, Aerojet and many other large and small private companies. “I really appreciate the fact that they invited us out because it gives us the opportunity to show the work that we do here. We should take advantage of all those opportunities to tell our story and I think it was told well,” said Blanco. The next day Neitzle and Blanco shared their story from the Edwards booth titled, “What’s up at Edwards?” on the capitol building’s lawn while Smith talked with state politicians. Blanco and Neitzle passed out maps to show where Edwards and the R-2508 Restricted Airspace are located. They also handed out flyers summarizing some of Edwards AFB’s capabilities, the impact on the community and small posters with pictures of aircraft that have been tested at Edwards. Three NASA centers located in California participated in the American Institute of Aeronautics and Astronautics 5th Annual California Aerospace Days in Sacramento, Calif., Feb. 29-March 1, 2016. The event featured panels, exhibits, hearings and discussions highlighting the importance of aerospace. 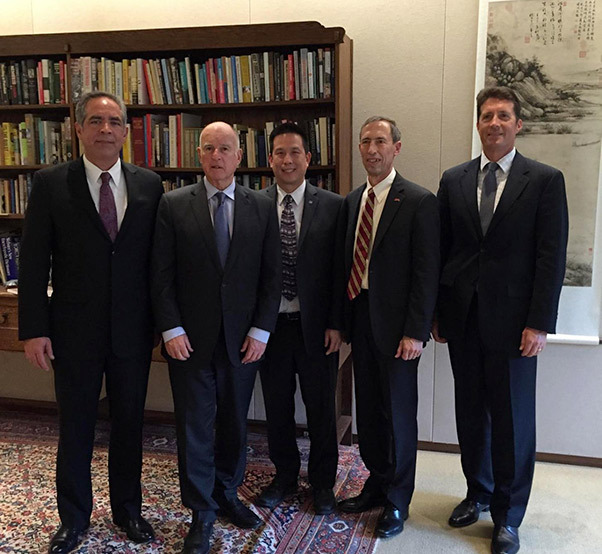 Eugene Tu, director of NASA’s Ames Research Center in Silicon Valley, Lt. Gen. Larry James, deputy director of NASA’s Jet Propulsion Laboratory in Pasadena, and David McBride, director of NASA’s Armstrong Flight Research Center in Edwards met with Governor Jerry Brown to discuss the agency and its wide range of aerospace work in California. 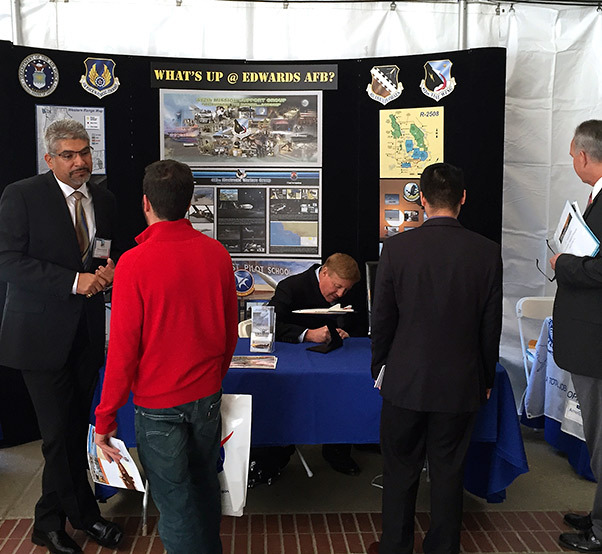 A three-man team from Edwards AFB took a trip to the state capitol Feb. 29 – March 1 to tell the story of Edwards at the fourth annual 2016 California Aerospace Days. The two-day conference for legislators at the California State Capitol brought together state lawmakers and their staff to learn more about the importance of aerospace to California. NASA representatives from Ames, Armstrong and JPL engaged approximately 1,000 visitors from area schools and the state legislature. The public viewed displays of aeronautics, satellites and solar system exploration on the grounds of the State Capitol. Ames highlighted next generation air traffic management initiative ATD-2 and the UTM drone traffic management system, as well as several small satellites and robotics projects, including SPHERES.